(Bloomberg) -- With his baby face, eyeglasses and go-to outfit of T-shirt, jeans and sneakers, Jihan Wu looks more like a geeky teenager than a self-made billionaire. But thanks to an early foray into cryptocurrencies, the soft-spoken 32-year-old is sitting on what may be one of the industry’s largest fortunes. Wu runs Bitmain Technologies Ltd., the world’s dominant producer of cryptocurrency mining chips. The Chinese company has been shrouded in secrecy since its founding five years ago, but Wu is gradually lifting the veil -- and revealing clues about his personal wealth -- as he pursues an expansion beyond the crypto-sphere that may eventually lead to an initial public offering. 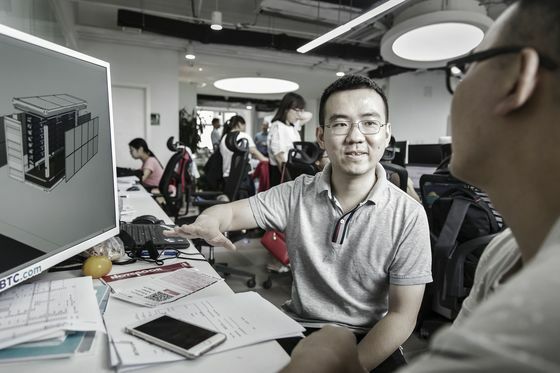 In an interview with Bloomberg News, Wu said Bitmain booked $2.5 billion of revenue last year and that he and co-founder Micree Zhan together own about 60 percent of the business. While Bitmain has few direct comparables, applying a multiple similar to that of publicly traded chipmakers such as Nvidia Corp. and MediaTek Inc. would give the company a valuation of about $8.8 billion. That would make the co-founders’ holdings worth a combined $5.3 billion, according to the Bloomberg Billionaires Index. Read more about Wu’s backstory and Bitmain’s AI expansion. Wu, who said he has a smaller stake than Zhan, declined to share details of his net worth, his cryptocurrency holdings and his other personal investments. He has previously said Bitmain is worth $12 billion. Zhan declined to comment. Given the uncertainty surrounding digital assets and the limited public information about Bitmain, any estimate of the Beijing-based company’s value -- and its owners’ wealth -- inevitably involves a lot of guesswork. But that could be about to change. An IPO would not only open Bitmain’s books to the world, it would also allow the stock market to assign the company a value in real time. While Wu said he has no specific plans at the moment, he’s open to a listing in Hong Kong -- or in an overseas market with U.S. dollar-denominated shares -- because it would give early investors including Sequoia Capital and IDG Capital a chance to cash out. “The challenge is advancing our technology beyond what we’ve already achieved,” Wu said in an interview at the Four Seasons hotel in Hong Kong. Read more about China’s technology ambitions. 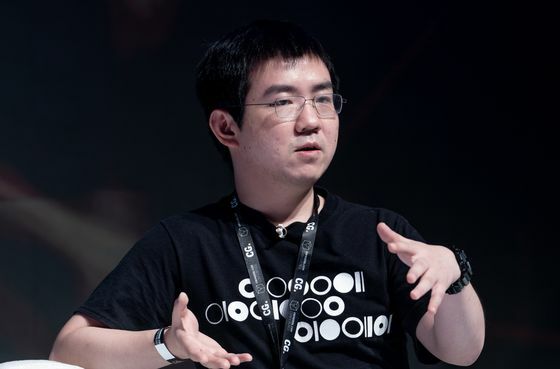 One of Bitmain’s biggest competitors, Canaan Inc., has already filed for a Hong Kong IPO that people with knowledge of the matter said could raise about $1 billion. Bitmain’s 2017 revenue was about twelve times that of Canaan’s. Bitmain controls as much as 80 percent of the market for crypto mining gear, according to a February report from Sanford C. Bernstein & Co., whose most conservative estimate of the company’s operating profit is similar to that of Nvidia’s. Bitmain’s Antminers -- server-sized boxes filled with dozens or hundreds of identical high-powered chips -- sell for a few hundred to a few thousand dollars and are typically bought in bulk by professional operators with access to cheap electricity. Bitmain is the industry’s “800-pound gorilla,” Roger Ver, the virtual currency proponent known as Bitcoin Jesus, said in an interview. While the company gets most of its revenue from mining equipment sales, it also runs some of the biggest mining collectives, in which members combine their processing capacity and split the rewards. 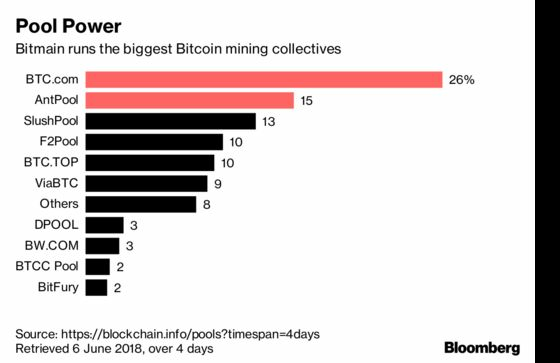 Bitmain’s AntPool and BTC.com collectives control more than 40 percent of the world’s Bitcoin mining power, according to blockchain.info. The company’s outsized role has prompted a backlash from some virtual currency purists, who disdain anything that hints of a concentration of power in the crypto ecosystem. But Wu brushes off the naysayers, pointing out that lots of rivals are angling to grab market share. 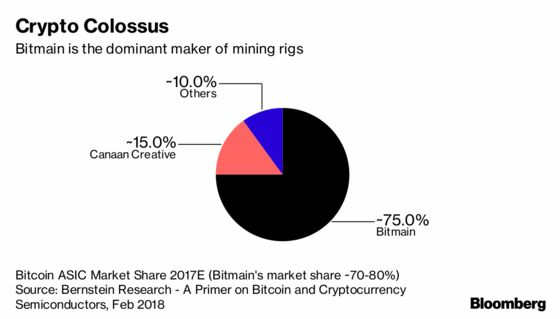 “Bitmain is trying very hard to maintain its advantage,” he said. Stiff competition would be just one of several risks for investors in a potential Bitmain IPO. This year’s tumble in cryptocurrency prices -- Bitcoin trades at about $7,676, down from a December peak near $20,000 -- has squeezed mining-industry profits, while the number of mine-able Bitcoins is creeping ever closer to its 21 million limit. Bitmain may be diversifying, but a successful push into AI is far from guaranteed, according to Mark Li, a senior analyst at Bernstein who says Bitmain is likely worth less than $10 billion. Despite the headwinds, a Bitmain offering would garner plenty of attention from Hong Kong investors, who lack compelling options to bet on China’s nascent chip industry, according to Kevin Wang, an analyst at Mizuho Securities Asia Ltd.